Quilting in the hoop designs for "The Butterfly"
You've fallen in love with "The Butterfly" design collection, and you're longing to make your own version of this stunning quilt. But there's a problem: you really want your finished quilt to look like the one in the photo - and you have no idea how to go about quilting beautiful feathers. 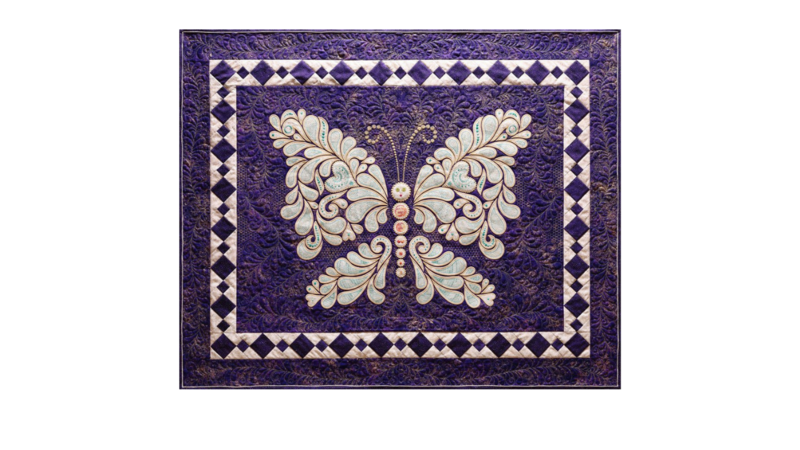 Midnight Butterfly provides you with gorgeous quilted feather designs for The Butterfly 100 Quilt that can be quilted in the hoop on your embroidery machine. Midnight Butterfly also includes quilted in the hoop designs for quilting The Butterfly Body Pillow. To use the Midnight Butterfly designs to quilt your Butterfly 100 Quilt first, then add the embroidered applique and then add a false back, you will need a hoop size that is at least 200mm x 300mm. To use the Midnight Butterfly designs to quilt your Butterfly 100 Quilt after the embroidered applique is finished so the quilting will be visible on the back of your quilt, you will need a hoop that is BIGGER THAN 200mm x 300mm. A hoop size of at least 240mm x 360mm is recommended. To use the Midnight Butterfly designs to quilt your Butterfly Body Pillow it is recommended that you quilt the background first and then add the embroidery and embroidered applique, using a false back. You will need a hoop that is at least 200mm x 300mm. Midnight Butterfly contains quilting in the hoop designs only. Embroidered applique is NOT included - it can be found in The Butterfly.